Today I drove the length of the Skyline Drive – 105 miles down the Blue Ridge Mountains, at a maximum speed of 35mph. Doing this was always going to be one of the highlights of the trip and it didn’t disappoint. 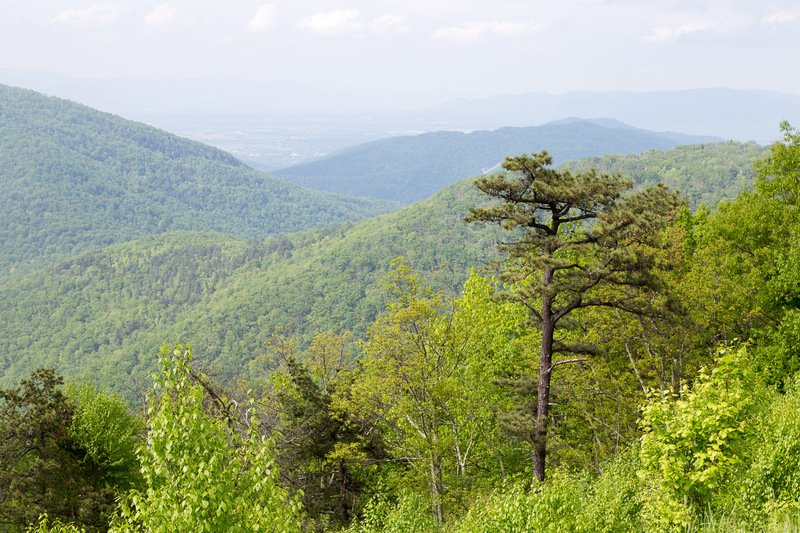 As you drive along it, there are ‘Lookouts’ every few miles from which views can be had of the Shenandoah Valley to the west and the Virginia plain to the east. From several of these there are way-marked hikes, either through the woods, up to peaks, or down to waterfalls. I did two of these – to Stony Man Mountain, at 4011 feet the second-highest point in the mountains, and to a waterfall. There also couple of places where there are restaurants, restrooms, visitor centres, etc. Altogether the journey took me most of the day. I joined the road at its northern end at about 10 o’clock and I reached the southern end at about 5:15. There’s a charge to drive it – $20 per car – and only two (I think) exits along it, at about 30 and 65 miles. It was a great experience doing the drive. I was wondering if by the end I would be bored – “oh, look, another amazing view….” – but I wasn’t. It helped that the weather improved as the day went on – the early views were quite misty, the later ones were sunny. But the best thing is to just show some of the pictures I took. Enjoy. The only time I think I went to the Shenandoah Valley was on a Greyhound bus en route to New York, I think. I doubt we went on the same route as you, for that reason. It was just getting dark as I was going through there, and all I really remember of it was a stunning sunset. It does look beautiful, though.